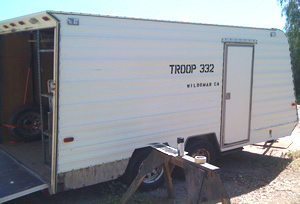 The trailer was 18 feet in length and had the words “Troop 332 Wildomar CA” on it. The Lake Elsinore Police Department is currently seeking the public’s help to locate a Boy Scouts trailer that was stolen Saturday from the 21000 Block of Wait Street in Wildomar, Sheriff’s officials reported today. Hall said the trailer was 18 feet long and had California License Plate 2FR8416 attached to it and contained the phrase “Troop 332 Wildomar CA”. Anyone who may have come across the trailer, or have knowledge of its whereabouts, is encouraged to contact Investigator Cornett at (951) 245-3357, or by email at LakeElsinoreStation@RiversideSheriff.org.